While we may have many words we can use to represent our emotions, there are some feelings that no English word can describe. 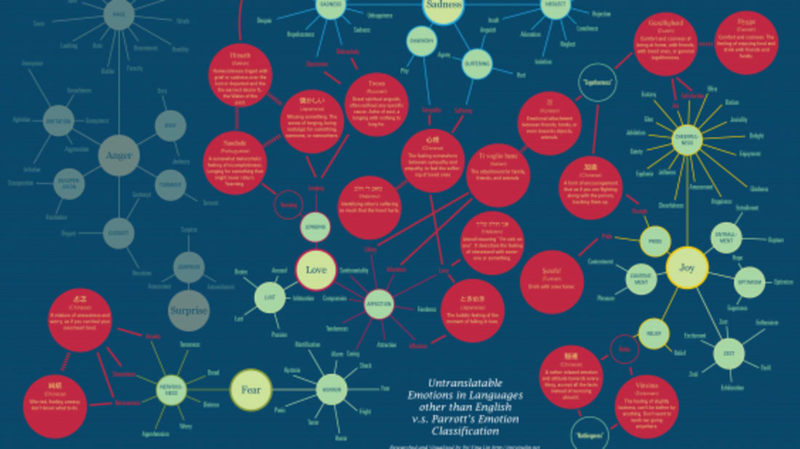 But that doesn't mean other languages don't have words for them—and as part of an ongoing project called Unspeakableness, design student Pei-Ying Lin created an infographic that ties feelings we have no names for to their foreign language word equivalents. [She] found that their definitions in English usually came down to something like, "it is a kind of (emotion A), close to (emotion B), and somehow between (emotion C) and (emotion D)." Next, to visualize the relationship between the foreign emotion-words and English ones, Lin used a linguistics model to map out five basic emotions (large yellow circles), along with several descriptive words related to each (smaller green circles). Finally, she used her sources' descriptions to place the new/foreign words on the English map. On her website, Lin says the project is one "that investigates human emotions and languages. By re-looking at how humans communicate, it searches for a way to connect our inner self and personal emotions, through the design of a personal language and several new ways of communication. It is an investigation of how language can be improvised to connect our emotions in this multilingual world." 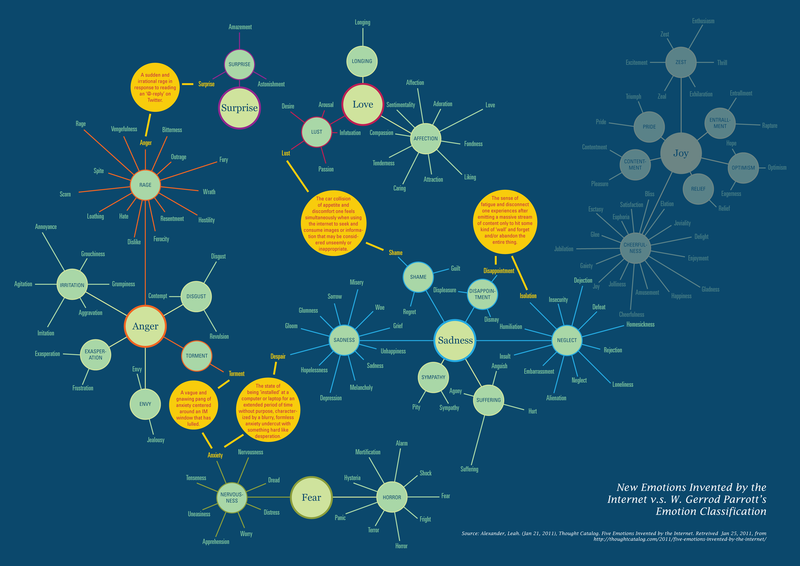 Lin has also made an infographic for emotions created by the Internet.